The absolute worst case scenario you encounter in the world of finance today is a catastrophic stock price decline. The good news, you are immediately told, is that even if this worst case scenario should improbably occur you must only hold on tight, close your eyes, and purchase more stocks. Everyone that has followed this strategy over the last 80 years in the United States market has done fantastic. Sounds good, right? You know the people running the casino have no financial advantage by keeping you playing, they only have your best interests at heart.....right? 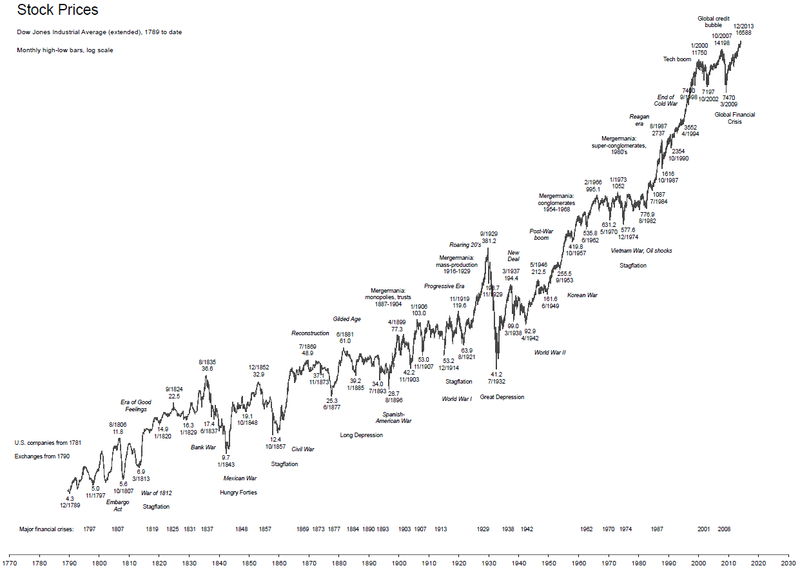 The following chart shows U.S. stock prices from 1789 to 2014. If you are looking for a big picture, this is it. What jumps out at me on this chart? First, you'll notice that if you began purchasing stocks around 1938, or any time over the last 76 years, every major dip in the market recovered almost immediately to go on and make new highs. Everyone that held on, bought on the dips, and was strong through the storm grew richer and richer. 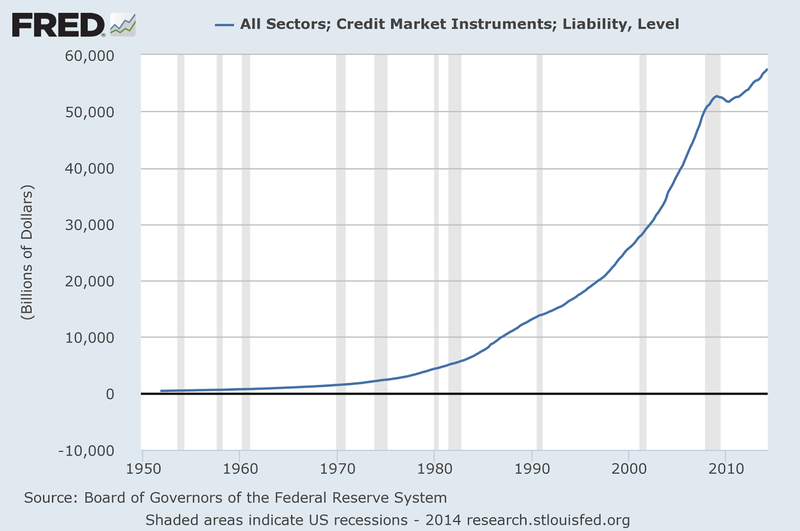 1937 to 2014 (ish) will be written in history as the golden age of the U.S. economy and U.S. financial markets. It became the strongest economy in world history in the 1950's and 1960's and it has held the illusion of wealth for decades beyond by borrowing almost 60 trillion dollars. What about before 1938? You can see that the 19th century was not as kind. If you bought stocks in 1837 at the market peak, 60 years later your portfolio was underwater. Please read the last sentence again, then imagine talking to a person about "buying the dips" and "stocks always rise in the long run" at the turn of the 19th century. How about in the early 20th century? If you bought stocks in 1907, your portfolio was underwater 25 years later. If you bought stocks in 1929, your portfolio was underwater 25 years later. Yes, 25 years later, at a time when the United States was a global economic powerhouse. It had real wealth built on a strong currency, savings, business growth and exports. How about another country? Maybe one where investors experienced almost immediate gains after they bought every dip for 45 straight years. The following chart is the Japanese stock market, which peaked in 1990. 25 years later the market is 60% below its peak, after a massive rally that began in late 2012. How about real estate? 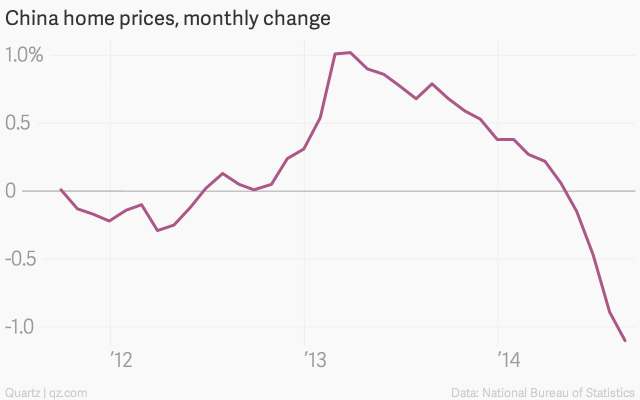 We all know real estate prices always rebound immediately. In the United States there has been only one vivid memory of price declines over the last 80 years, which occurred from 2007 - 2012. Since then, however, prices have come roaring back and some cities have already surpassed their pre-2007 bubble price peaks. Is it possible that real estate prices could decline, and then keep declining? Here is a chart from Japan's 1990 peak in real estate prices. 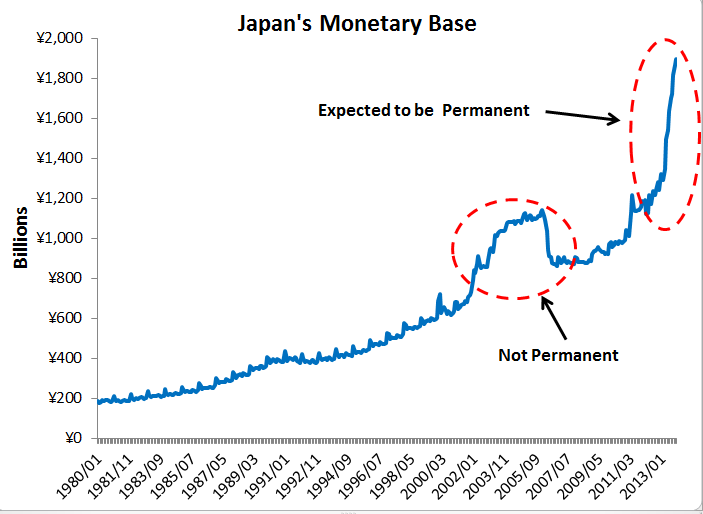 The obvious answer to these problems in Japan is someone did not have the courage of Ben Bernanke to step in and save the country with a printing press. Only they did. They increased the monetary base almost 300% from the early 1990's through 2007 with multiple QE programs. This led to 65% declines in housing over that period coupled with a 55% loss in the stock market. Investors in the United States have been conditioned to believe that when prices of financial assets decline, they will immediately rebound after some short term pain. This is what allows them to be "all-in" the financial markets. What if U.S. stocks, bonds and real estate prices all declined simultaneously and did not immediately recover? Wait, is it possible that bonds can fall simultaneously alongside stocks? A 33 year bull market in bonds, which is in its final stages today, has conditioned investors to believe this is impossible. Bonds were clobbered in the 1930's, alongside stocks and real estate, when the U.S. had a fundamentally strong economy. 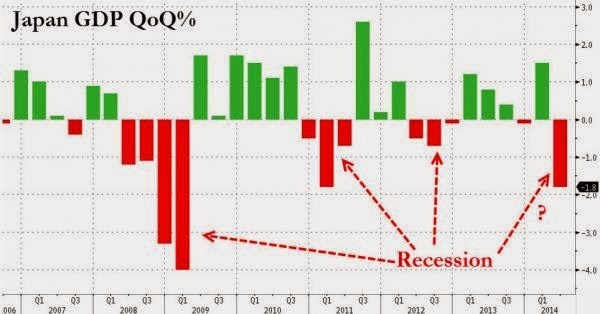 Today the U.S. economy has a fundamentally weak economy. It is a house of cards, smoke and mirrors, a QE mask sprayed on a mountain of toxic debt. The global economy is now counting on the United States to pull it out of the current economic malaise at a time when the U.S. economy is on the brink of falling back into decline. 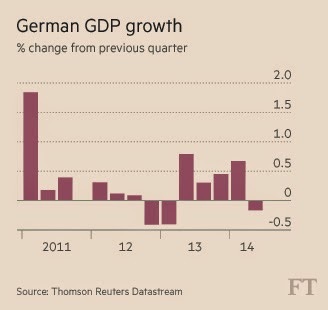 Germany, the once lone bright spot in Europe, has likely just triple dipped into recession. 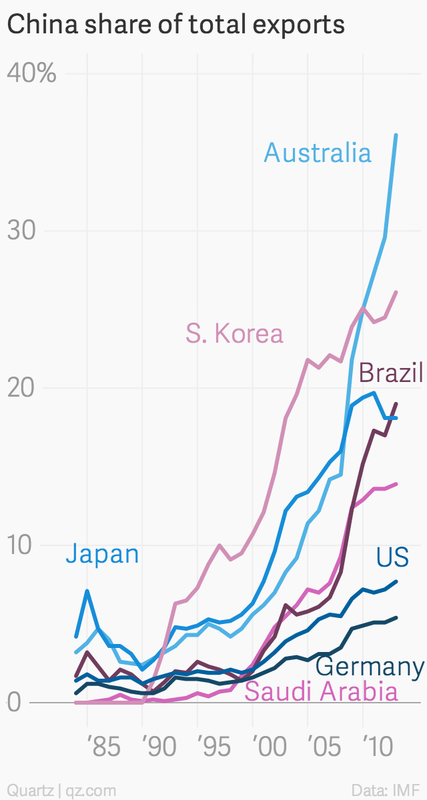 Japan has joined them, only their economy is collapsing faster. China is contending with an enormous real estate bubble combined with banking sector debt that has risen from $10 trillion in 2007 to over $25 trillion today (the entire U.S. banking system is less than $15 trillion in size). The world entered a global depression in December 2007 which it has not emerged from. The patient was provided an unprecedented dose of morphine stimulus which is now wearing off. Central banks are already "all-in" with bloated balance sheets and interest rates resting at zero. There is no exit, and there is no one coming to the rescue. You cannot solve a structural debt problem in the global economy with more debt and printed money. It only pushes back the pain and intensifies the next crisis. Portfolio advisors today recommend holding an extremely low level of cash and precious metals as a share of your total portfolio. I recommend you increase those percentages, specifically the cash allocation. Why? 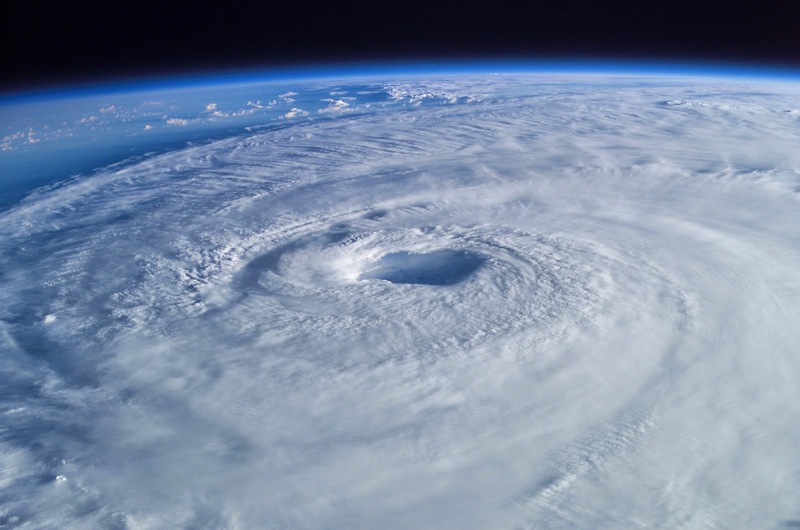 You cannot purchase insurance after the hurricane arrives, and there is a level 5 hurricane approaching. I love the clear logic behind your blog. I read every post - and even though you seldom get comments, please know that your efforts are highly appreciated. Thank you, I'm glad you enjoy the information.